Swim suit season is just around the corner !!! Did you know your Coolsculpting results are visible in as early as 30 days, & you could continue seeing results for up to 90 plus days ?! Let’s not waste another day! Join Kris or Sharon and get started on your own personal Coolsculpting event! Take off the tummy fat now and enjoy a spectacular swimsuit summer! 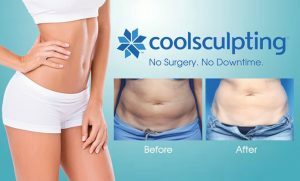 Give us a call to find out how Coolsculpting will work for you. Have you tried the ZO® 3-Step Peel™ ? The ZO 3-Step Peel (Professional Use Only) is an incredibly effective peel treatment for tired, aging winter skin. This treatment is performed only by our Advanced Aesthetician, and the results are simply incredible! Do you have sun- or wind-damaged skin? Fine lines or uneven texture? Are you looking to smooth out dry, rough skin? Get rid of dark spots? Then the 3-Step Peel by ZO is for you. The Eyes have it … and then some, this month at Villano | MD. Enjoy savings on these great eye enhancement products.